New methods to control defects in 2D materials, including graphene that can result in enhance membranes for energy storage, advanced protective coating, sensing or water desalination have been developed by scientists at the Penn State’s Department of Energy's Oak Ridge National Laboratory and Lockheed Martin Space Systems Company. Defects such as small holes and cracks in 2D, one-atom thick materials like graphene can have a huge impact on the performance. Such defects are usually considered undesirable, however if these defects can be controlled, they can be employed to develop desirable, new properties in the material. As long as you can control defects, you might be able to synthesize into graphene whatever kinds of response the material will give you. But that does require that you have very good control over defect structure and defect behavior. What we have done here is a pretty strong step towards that. van Duin is the main developer and co-inventor of the Reactive Force Field Method (ReaxFF), a mathematical modeling and simulation method, he is also the Kenneth Kuan-Yo Kuo Early Career Professor and professor of mechanical engineering and chemical engineering, and corresponding author on a recent paper in ACS Nano. This technique has the ability to predict the communications of thousands of atoms when they are affected by external forces. In this case, the external force is noble gas atoms that bombard graphene. In order to enhance the properties of graphene, noble gases such as neon, xenon, krypton, helium and argon are employed to create defects. One or more carbon atoms are knocked out of the chicken wire-shaped structure of graphene. The resulting hole is then filled with specific molecules or atoms of another material, using a process known as doping. For example, the physical or chemical properties of graphene can be altered using doping, to enable the flow of water molecules through a membrane, while blocking salt particles. We have done a series of atomistic scale simulations where we accelerate noble gas ions into the graphene. The simulations gave much the same defect patterns as experiments. That means our simulations can tell experimentalists what dose of atoms at which acceleration they need to get those types of defects. 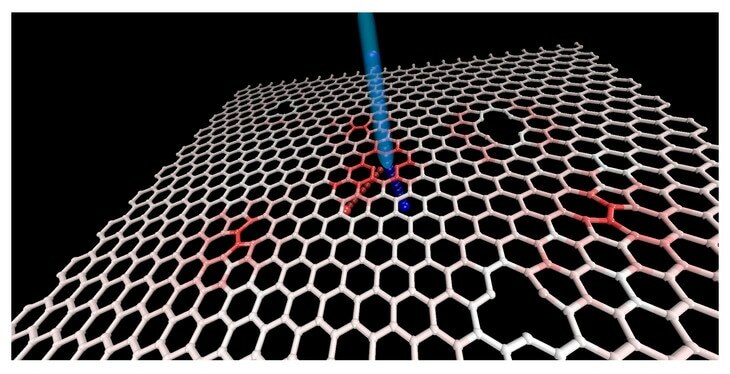 As defects can move around or change shapes in seconds after their creation, van Duin and team also stimulates placing the graphene in the oven and annealing (heating at high temperature), so as to stabilize the graphene structure. van Duin stated that it is atypical for an atomistic simulation to match the same time, size and exposure range of an experiment, because of the computational expense of performing interactions between thousands of atoms over the time required to stabilize a material. Designed by van Duin and William A. Goddard of Caltech, ReaxFF is capable of modeling physical and chemical interactions in materials and molecules as bonds among atoms form and dissolve. "This study provides insight into the atomistic scale details of graphene irradiation and is a preliminary step in designing functionalized carbon materials in two dimensions," said Kichul Yoon, the paper's lead author and a graduate student in van Duin's group. van Duin adds, "Clearly there is nothing that makes this exclusive to graphene. Any 2D material can be treated with the same simulations. Anyone who wants to dope a 2D material or understand defects will be interested in these simulations." The scientists plan to work with Lockheed Martin in the future on aerospace applications. They will also work to achieve graphene-based water desalination. The samples used in the experiment were prepared by Lockheed Martin’s Jacob Swett. These samples were highly important in the progression of the experiment. The scientists relied on the Center for Nanophase Materials Sciences, a Department of Energy Office of Science User Facility at ORNL, to correlate the simulations and experiments, create defects by employing ion bombardment and characterize the defects with atomic-resolution imaging. At CNMS, we have state-of-the-art Helium and Neon ion beam and aberration-corrected scanning transmission electron microscopy instruments that permit atomistic scale characterization. The endeavor was supported by the Fluid Interface Reactions, Structures and Transport Center, an Energy Frontier Research Center, which is funded by the U.S. Department of Energy, Office of Basic Energy Sciences and Office of Science.